Fluorescent Vs Retroreflective, what’s the difference? Fluorescent Vs Retroreflective – is there really a difference? Well in short yes! If you work in the world of PPE and PPW, then the words ‘fluorescent’ and ‘Retroreflective’ certainly aren’t new. However, comprehensively understanding their difference – by stripping away marketing ‘jargon’ – can make recommending the correct gear to the correct consumer, easier – giving you peace of mind, and at the same time happy customers! So let’s explore Fluorescent Vs Retroreflective, what’s the difference? Impregnated with pigment, fluorescent material converts any light shining on the fabric, through the UV spectrum to light in the visible spectrum. This noticeably increases the amount of visible light reflected from its’ surface and therefore, only works where an appreciable amount of UV light, i.e. daylight, is available. So remember, artificial light sources, which are common when working at night contain little UV light and could render the garment useless for its intended purposes. Usually, pigments in fluorescent materials, only can be applied to synthetic fibers such as polyester. These materials can sometimes be very uncomfortable to wear, especially during hot conditions. AS/NZS 4602:1999 High Visibility Safety garments does allow for high visibility materials made from natural fibers such as cotton. Where safety requirements require a garment to be made of natural fibers (materials that are not capable of taking a fluorescent pigment), the fabrics may use a non-fluorescent colour as specified in AS/NZS 1906.4 in lieu. These materials appear dull when compared to the man-made materials however they are offer much greater levels of wearer comfort. These materials and the garments where they are used do not offer the same visual protection of the synthetic materials. Fluorescent materials must meet the requirements for Class F according to AS/NZS 1906.4:2010 Retroreflective materials and devices for road traffic control purposes - high-visibility materials for safety garments. Colours for normal purposes are specified as either red-orange or yellow. Where there is a requirement in a particular industry or other situation for a clear colour distinction is made between the colours red and orange, one of the special purpose colours specified in AS/NZS 1906.4 should be selected. Retroreflective materials cause practically all of the light reflected from their surface to be directed back along the path of the incoming light beam. An observer will not gain the benefit of a Retroreflective article unless he/she is observing it from a position closely aligned with, usually just behind, the light source, e.g. a motor vehicle driver sitting almost directly behind the vehicle headlights. 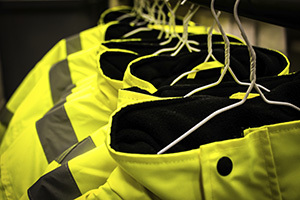 Elliotts’ High Visibility Safety garments only use high quality Retroreflective materials from 3M and Reflexite.